It's 6:30 on Monday morning, and while most of the work force is sleeping in on Labor Day, Maria Akis is walking out her door. She lives on the edge of MacArthur Park and is going to her job as a restaurant server at a hotel in Downtown Los Angeles. Considering it's a holiday, and Metro schedules usually run on an abbreviated schedule, I'm a little worried that we aren't going to make it to her job downtown by 7, but she assures me, "Metro takes half an hour." Even I – who prides myself on my confidence of in the Metro – seems skeptical, but we venture forth. As we walk, sun still rising, I ask Maria what it is like to have always lived in LA without a car, (she moved here only a year and a half ago from Pittsburgh) and she admits, "It's sometimes annoying to get to places where you have to talk multiple trains or buses. Uber's are expensive, I was at the Annenberg seeing this show called "Generation Wealth"...the Uber was $17 from my house, and surging, I walked part of the way to get home...there isn't much shade in L.A. once you get off transit." This feeling of walking in a pedestrian wasteland is particularly strong coming off the week-long heat wave. In too many areas of the city, particularly around the Annenberg Space for Photography, heat coming off the wide boulevards of black asphalt and low concrete buildings offering little shade for cover makes pedestrians feel alone and unaccounted for. However, MacArthur Park couldn't be more different. Even at 6:30 AM on a holiday, the streets are activated. This dense population of over 103,000 people in under 3 square miles makes it the second largest neighborhood by population in Los Angeles. Very few buildings have parking options and it's all centered around a large park that dates back to the 1880's. "I love MacArthur Park like it is. I would hate to see the chaos taken away. What's really nice is the breeze that comes off the lake, the little bit of grass, it makes a difference," she says. She talks about how even though she doesn't spend a lot of time physically in the park it affects the environment of all the apartments that face it, she even laughs about how she has a hummingbird that sometimes visits her on her balcony when she has her morning coffee. It only takes about three minutes to walk to the station that she uses to get to her two jobs downtown. While many neighborhoods on the Eastside are transit-friendly, MacArthur park is the first that I've seen that is almost anti-car; there just isn't any room left to add parking. There is no parking at Maria's building and very few nearby lots. Transit here is the best way in and out, that's probably one of the reasons why there is such a vibrant market of vendors at the entrance of the station. 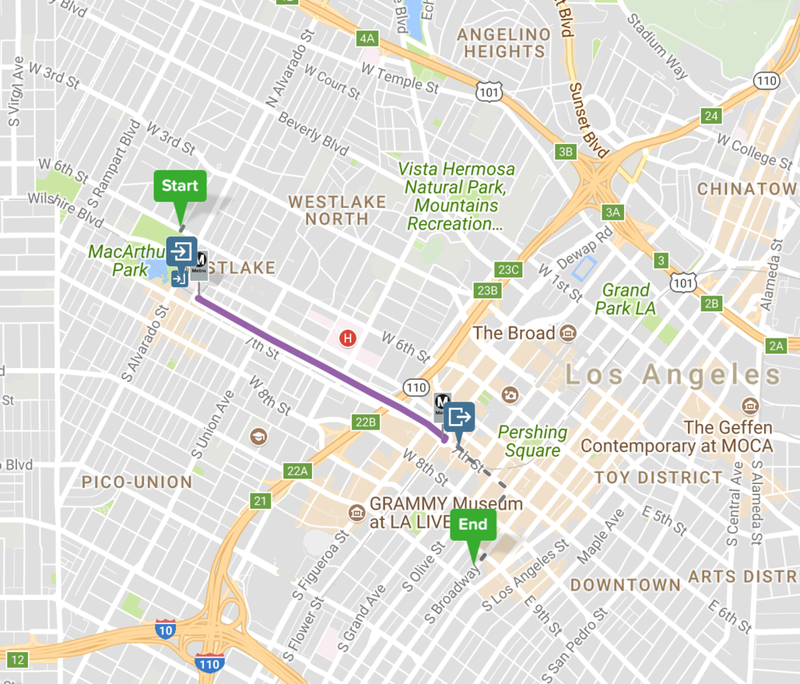 In fact, as we are walking I realize my fear of making Maria late is unfounded, I forget that MacArthur Park station is served by both the Purple and Red Lines so trains run frequently even on a holiday. She says, "I love that about my neighborhood. I've thought about moving to other parts of the city but having both lines here is amazing. It comes every four minutes toward Downtown in the morning." As we get down to the platform I ask her what aspects about her commute she wished could be improved and she quickly brings up that her second job has her coming home from Pershing Square station and the lack of seating there is disappointing. She assumes it's because of the large transient population that hovers around that station causing Metro to resist adding seating but as we look around at the station we're in, another preferred stop of the homeless population in LA, there is plenty of seating. Whatever the reason, it's an unfortunate truth however that the Pershing Square station feels barren despite its cavernous size and multiple entrances. It does not have the vendors of MacArthur or the volume of 7th & Metro. Stepping on the train, she says that beyond seating she doesn't have many qualms with her daily commute, "I can rely on it...It's honestly interesting to me seeing the different vendor's and peddlers on Metro...there is an incense guy...I asked him how business was going once and he said it was good!" The interaction is one I know well. I too have had meetings with the incense man, while sometimes pungent, he's a nice guy doing his thing and I am often amazed by the number of people looking to buy the scented sticks. As we step out at 7th & Metro, only one stop later, we cut through the new entrance via The Bloc and Maria remembers, "I also love how each station is different! The blue and orange tiles of the MacArthur Park Station...when my best friend was in town we did a photo shoot in the Pershing Station because of the different neons." I admit that while used to think of them as superfluous when I first saw them, and still think a few are strange (the flying people at Civic Center is very unnerving in my opinion), and yet I have seen tourists enjoy them...I chalk it up to quirky L.A. charm. Even though we had only gone a single stop, we walk up into a different world. Downtown L.A. with its high-rises and smaller population it is a vastly different place than its neighbor. Maria talks about how she fears gentrification may risk the city becoming more homogeneous one day and she hopes Los Angeles can figure out a way to keep neighborhoods intact even as new people move in. One thing MacArthur Park has the going for it is that the lack of car accessibility, slowing the influx of change. While the neighborhood will inevitably evolve, as all neighborhoods do, one can hope that whatever happens we can find a way to keep the vibrancy, the vendors, the life. However, not all change is bad. As for Downtown, along with all the new high-rises, one improvement she hopes to see is additional green space and trees just as she has in MacArthur Park. Her own neighborhood is a good example that density doesn't mean one must forego nature. Walking through the neighborhood of construction zones you can see the newly planted tree's and rising towers but only time will tell what they will bring. By the time we reach the front door of her restaurant a few minutes later I look at my clock and realize the whole trip took twenty-one minutes. Not bad for an L.A. commute.